Bangkok (Thailand) – November 19, 2018 (travelindex.com) – Iconsiam, the spectacular Bht 54-billion, landmark development and iconic landmark of Thailand’s eternal prosperity on the Chao Phraya River, today, opened the first floating museum in Thailand on the ‘Sri Mahasamut Ship’ – the symbol of river-borne prosperity, to commemorate King Taksin the Great on the occasion of the 250th anniversary of the foundation of Krung Thonburi Sri Mahasamut. The museum showcases the life and legacy of King Taksin the Great in an exhibition using advanced techniques to tell stories and create a spectacular experience for visitors by making them feel like they are going back in time while boarding this ship. The sensational opening of the floating museum ‘Sri Mahasamut Ship’ has been held with an exciting light and sound show and a Ramakien puppet performance featuring ‘Hanuman Flirting with Varin’ episode, which is significant because it was written by King Taksin the Great himself. The ceremony was presided over by Dr. Visanu Krua-ngarm, Deputy Prime Minister. Joining the occasion were managements of Iconsiam, sponsors, and renowned actors namely ‘Aum’ Atichart Chumnanon, ‘James’ Jirayu Tangsrisuk, and ‘Nune’ Woranuch Bhirombahkdi. Conducted in front of the floating museum ‘Sri Mahasamut Ship’ in the midst of the picturesque view of the Chao Phraya River at River Park ICONSAIM, the ceremony symbolises the ship being about to set off on a voyage once again. 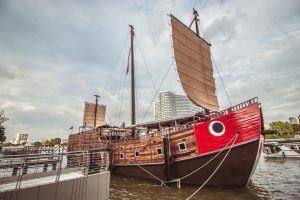 The spectacular ‘Sri Mahasamut Ship’ was exquisitely modeled after the red head ship, as called by the Teochew people. Inside, visitors are able to observe different areas of the vessel which tell historical stories in an exhibition using advanced interactive techniques to offer a virtual reality experience as if one is thrown back to the time bygone on the real ship. The exhibition area is divided into three zones. Zone 1 – Captain’s Cabin showcases a history and accounts of ship trade, the capital building and relocation, and Krung Thonburi as a port city for commerce. Zone 2 – Crew Cabin demonstrates an atmosphere and life on board. Zone 3 – Civilization Archive contains a biography and initiatives of King Taksin the Great in city rebuilding, a chronology of wars to unify the kingdom, Thonburi-China trade relations and diplomacy, world trade routes, and ‘ship’ as a symbol of prosperity. There are also hands-on activities for visitors to enjoy some on board experiences such as hoisting a cargo crate as if being a crew member of ancient times. Visitors can also change into national outfits of various nationalities through Kinect and take photos with the civilization archive and share them on board. The ‘Sri Mahasamut Ship’ also has a good view point on the top deck as well as retail and coffee areas for visitors. “Iconsiam, the spectacular Bht 54-billion, landmark development and iconic landmark of Thailand’s eternal prosperity on the Chao Phraya River, was created out of a resolution to glorify precious stories of pride from every dimension of Thainess in the nation by presenting them in exciting ways. It shows our full appreciation for the historical value, the background and the holistic value of the land on which this mega city project is built. So, on the occasion of the 250th anniversary of Krung Thonburi Sri Mahasamut in 2017, Iconsiam together with The Iconsiam Residences Corporation Ltd., The Iconsiam Super Luxe Residence Corporation Ltd., and the Government Savings Bank would like to take this auspicious opportunity to lead the way in commemorating King Taksin the Great. The floating museum ‘Sri Mahasamut Ship’ is one of the ways to glorify the value and significance of Krung Thonburi as part of our resolution to put together the best that Thailand has to offer and the best of the world as we encourage Thais to take pride in Thainess and to help maintain its beauty for the next generations to come while also making visitors from around the world fall in love and be impressed with Thailand,” said Mr. Chearavanont. Iconsiam is a spectacular global landmark that is located in Bangkok on a 55-rai riverside site with a 400 metre river frontage and a gross floor area (GFA) of over 750,000 square metres. It includes two of the world’s most glamorous retail complexes as well as two luxury waterfront residential condominium buildings of 70 and 52 floors, one of which carries the Mandarin Oriental Residences brand.